If you’re up for a desert adventure, take a journey back into ancient Egypt, to a time when majestic pharaohs rule the land. All you need to do is spin the reels of the Ramesses Riches Online Slot and you could discover your share of gaming treasure along the way. 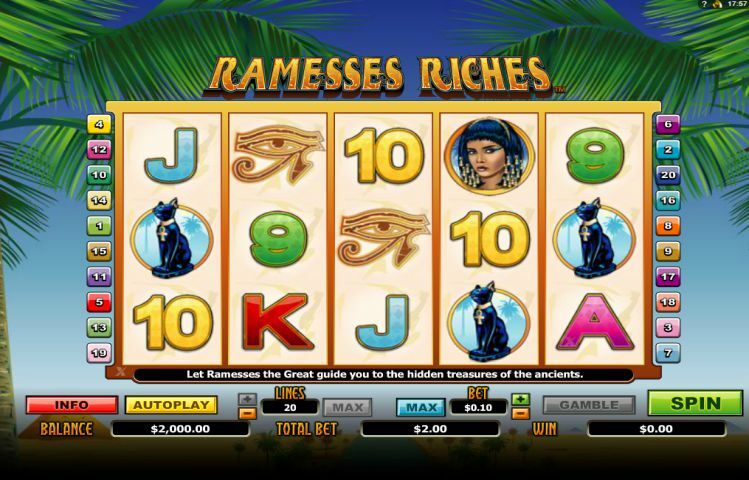 Released by Microgaming in 2011, Ramesses Riches offers players 5 reels and 20 paylines of Egyptian-themed fun and rewards. With colourful graphics, a soothing soundtrack and entertaining animation setting the scene, you’d easily find yourself transported to this ancient era. But beyond visual and audio effects and features, this video slot is also packed with generous payout opportunities. To unlock your share of Ramesses’ Riches, simply start spinning. You’ll find a wealth of winnings hidden on the reels, starting with winning combinations of the following icons on an activated payline: Green 9, Yellow 10, Blue Jack, Orange Queen, Red King and Pink Ace card symbols, along with Ancient Scrolls, Artifacts, a Black Cat and Cleopatra. Even more valuable is the Ramesses symbol which acts as the slot’s Wild and substitutes for other symbols, except the Scatter, to help create winning combos. Better yet, your wins will be doubled when it substitutes. The other powerful symbol to keep an eye out for is the Ankh logo which acts as the slot’s Scatter. When three or more Scatters appear, it can trigger up to 20 Free Spins during which all your wins will get tripled. For every Scatter that appears, you’ll receive 4 Free Spins – plus any wins with the Ramesses symbol will be multiplied by six. And yes, our Free Spins can be re-triggered. Also don’t forget about the slot’s Gamble Feature which is yours to take advantage of after every winning spin. Simply click on the purple Gamble button when it lights up and make your selection of either a Card Suit or Card Colour for a chance to respectively quadruple or double your winnings. If you enjoy Ramesses Riches, you might also find Microgaming’s other Egyptian-themed games like Ruby of the Nile, Throne of Egypt, Isis and Pharaoh’s Tomb, entertaining. All of the above are available to play at Gaming Club Casino, the world’s very first online casino. Established back in 1994, it’s been providing online casino fun and games to players from around the globe for over two decades already. There are many more reasons to become a Gaming Club Casino member. As a new player you’ll receive two welcome bonuses to get you started: a double-your-money match up to 200 bonus credits on your first deposit, followed by a 150% match up to 150 bonus credits on your second deposit. Other first-class membership benefits include daily match bonuses every day you log in, a host of fun-themed and prize-packed promotions you can enter, a loyalty program you’ll automatically qualify for and access to over 500 of the best online casino games. Joining is quick, easy and definitely worth it.